GE just announced a new LED light bulb replacement for the 100 watt incandescent that uses pulses of air to keep cool. The design is the first of its kind in the LED industry, and it comes just in the nick of time as the 100 watt incandescent bulb phase-out is on the horizon. The breakthrough hinges upon how the light ‘breathes’, keeping the LED chips from overheating and allowing engineers to pack twice the number of chips into a standard sized bulb. Packing 1600 lumens into such a small space required a fresh take on LED bulb design. 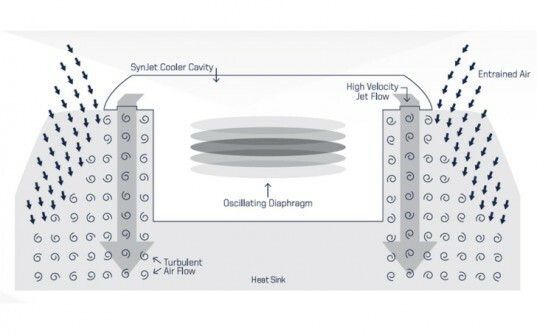 GE worked with Nuventix to miniaturize their sonic pulsing technology developed for cooling electronics. In the SynJet system a fluttering membrane pushes air currents thorough the cooling fins, effectively tripling their effectiveness. The technology is silent and has a life span of 100,000 hours. Like any semiconductor, the LEDs degrade quickly if not kept cool, so the new system allows GE to pack twice the typical number of chips into a small area. All this wizardry allow for the bulb to effectively replace a standard 100 watt bulb (and then some) while consuming a mere 27 watts. 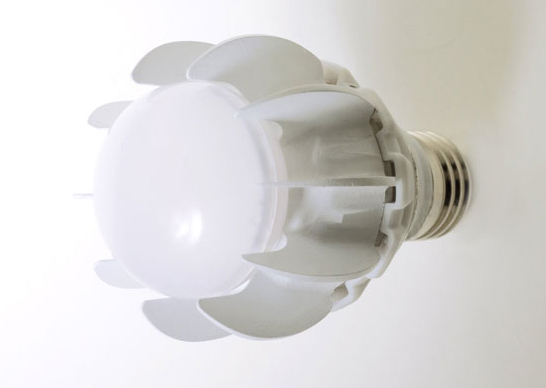 The bulb is run-of-the-mill in efficiency for a LED, and we expect it to perform similar to GE’s 13 watt LED with a mid 80s CRI, dimmable design, and long life of 25,000 hours. Due out in 2013 the bulbs are projected to cost upwards of $50 a pop to start, which will sound a lot better after you get the electric bill at the end of the month. Now all they have to do is make the light of materials which won't attract and attach dust particles from the air going by it.